I always liked the Skyway at Disneyland in California. Its route took you right through the middle of the Matterhorn, and this helped make it look like it belonged there. It was as much a part of the atmosphere of the Park as it was a ride. 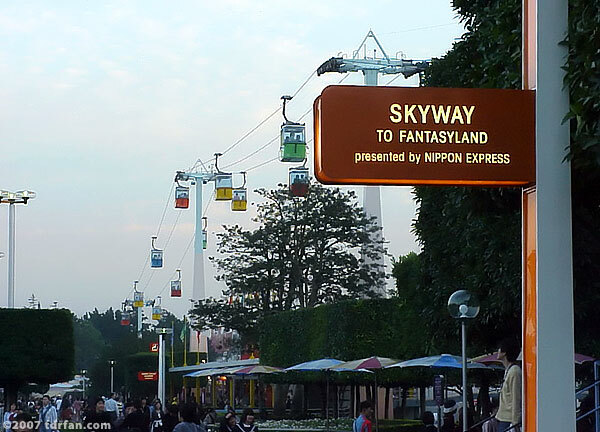 In contrast to the original Skyway in Disneyland, Tokyo Disneyland's Skyway seemed out of place. With no Matterhorn to play off of, the ride looked too pedestrian to belong in a Disney theme park. The route was a straight line along the far edge of the Tomorrowland side of the Park, and ran roughly from It's a Small World to Space Mountain. There were stations at both ends, and the one-way trip took a whopping 2 1/2 minutes. Although it did provide an aerial view of the area, the gray, industrial look of Tomorrowland meant that there wasn't much to look at once you were up there. Also different from the original in California, Tokyo Disneyland's Skyway cars were not "open air," but had Plexiglas windows enclosing the cars. This not only gave a measure of protection from the elements, it also meant people inclined to horse around couldn't inadvertently fall out of the car (although that was probably less of an issue with the ever-respectful Japanese). Postscript: The Skyway was removed in 1998 to make way for Pooh's Hunny Hunt. The entrance to the Skyway's Fantasyland station was just about exactly where the entrance to the Pooh ride stands now; the Tomorrowland station has been turned into a candy store.